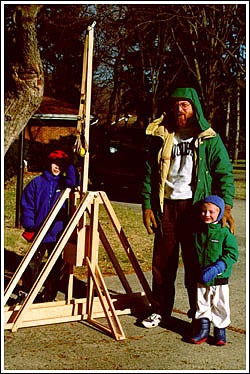 My trebuchet project was in the planning stages for a long time; that is to say, I thought about it from time to time, but never actually did anything about it. When my oldest son said that his second-grade class was going to be studying the Middle Ages, I was finally able to justify the project on educational grounds. 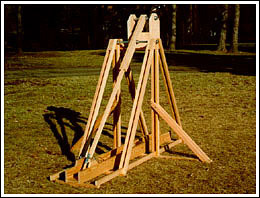 The trebuchet was used as a siege engine. Like its relatives, the onager and ballista, it was meant to hurl stones or other projectiles, while remaining safely out of range of arrows and the like. The treb's strong suit was hurling really massive stuff, like rocks, dead cows, and the odd messenger over or into castle walls. The principle of operation couldn't be simpler. The projectile is placed in a sling attached to one end of a pivoted beam. On the other end, a large counterweight is attached. One end of the sling is fixed to the beam, while the other is attached by hooking it over a pin on the beam. As the sling whips around, this end slips off the pin and releases the load. By adjusting the length of the sling and the angle of the pin, the range can be varied. This is simpler than adjusting the mass of the counterweight, which in really big machines could be as much as 10 tons or more. These trebs could lob a 300 pound stone nearly a quarter of a mile. For an outstanding site devoted to the trebuchet and other medieval technology, please visit The Grey Company Trebuchet Page. Much of my design and inspiration came from these folks, and they maintain an excellent list of links to related sites that I can't possibly hope to emulate. The entire frame of the treb is built from one-by-twos of Douglas fir, which someone told me has great shock resistance; it's a pretty wood, and its freedom from knots ensures strength. All joints are screwed and glued, to withstand the forces generated when it is fired. Initial dry firing, without a sling and projectile in place, caused violent bucking of the whole structure. I was about to go out and get some sandbags to hold the thing in place when I decided to try it once more with a payload (a tennis ball) and see if the additional mass would absorb some of the energy. Surprisingly, the bucking subsided nicely; although the tennis ball doesn't add much mass to the system, it is swinging around very fast on the end of a long moment arm formed by the throwing arm plus the sling. When the sling releases, it effectively doubles in length (although the mass of the ball is gone) which gives it an even greater moment of inertia. The end result is that most of the excess energy of the system is dissipated overcoming the inertia, and the whole machine has a very graceful motion. A simulation performed with a Mathematica program suggests that we should expect a range for this configuration of about 200 feet, ignoring such pesky realities as air resistance, friction, the mass of the sling and so forth. Our best range so far is about 120 feet, but we haven't done extensive tweaking yet, so this may improve. My original design called for using kids as counterweights, sitting in some sort of pivoting seat. This was abandoned because the resulting machine would be too difficult to transport, and I would be too subject to litigation. The model shown here fits in the back of a minivan, and is reasonably safe, although common sense should prevail. Don't let anyone stand directly in from of or behind the treb, where they could get whipped by the sling or throwing arm. For the same reason, bystanders should be kept back from the sides, in case the sling goes wild. Finally, don't throw in the direction of anything that could be harmed or that you can't afford to replace.